PERODUA ALZA is the second Malaysian MPV which is launched by Perodua after the launch of Proton Exora by Proton. The target market for this Perodua Alza is mainly for average income potential buyer who needs an MPV to fit a big family numbers with low budget and monthly payment. Perodua Alza can be categorised as compact MPV 7 seater while Exora is a large MPV 7 seater. Here we would like to share some specification of Perodua Alza and the Price of Perodua Alza MPV. For the first impression, when we look at the Perodua Alza, it really reminds us on Myvi that has been extended. But when we enter the cabin of Perodua Alza, it is slightly bigger and taller than Myvi. 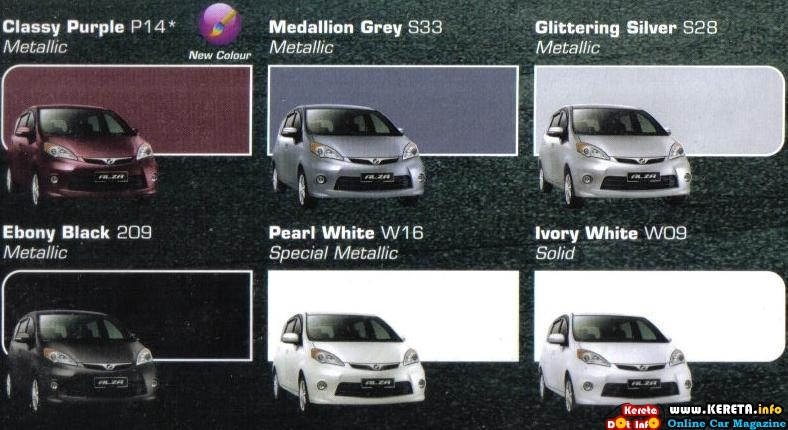 The new colour introduced by Perodua for the perodua Alza MPV are really attractive especially the Classy Purple and the Special Metallic colour. The interior finishing is simple, not a bit luxury like exora but still can accommodate 7 passenger inside. Even at the last row (3rd row) can be seated by 2 adult but with small legroom. The advantage of Perodua Alza is the 2nd row seat can be slide fore and aft and the power to weight ratio is better due to the weight of the Perodua Alza is only around 1150kg only. Just like a sedan car weight but has extended body for 3rd row seat behind. But the boot space is absolutely small and just enough for you to put small stuff. 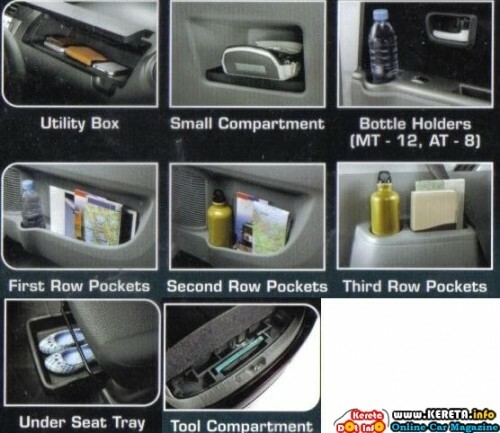 There are many compartment inside the perodua Alza Cabin at the dashboard, door panel and under the seat. To enter the 3rd row, it is quite uneasy because you need to slide the 2nd row seat forward. Perodua Alza MPV has no aircond vent on the 2nd and 3rd row and only rely on the main aircond vent from the front. How about the perodua alza fuel consumption (FC)? Basically with 1.5 litre engine, the consumption is slightly same with a sedan car with 1.5 litre DVVT engine like Toyota Vios but it can be more fuel consuming when you fit more than 5 person inside. It is slightly around 10 km/l – 13 km/l or RM0.138 to rm0.18 per kilometer. Booking fees for all perodua MPV ALZA is RM500. Overall, Perodua Alza is a good MPV 7 seater and also can be a city car for you to drive to work everyday instead of bringing your family balik kampung every holiday. Just like its simple elaboration of Alza, Kereta Juga MPV or a car one moment, MPV the next.